AiW note: This Guest post is part of a series of articles publishing on Africa in Words that come out of conversations between a new interdisciplinary network of researchers and literary producers examining the circulation and production of small magazines in Sub-Sahran Africa. This AHRC Research Network, ‘Small Magazines, Literary Networks and Self-Fashioning in Africa and its Diasporas’ is convened by Dr Madhu Krishnan (University of Bristol) and Dr Chris Ouma (University of Cape Town). You can follow the ongoing project, upcoming events, and future publications at https://www.smallmagazinesafrica.org. 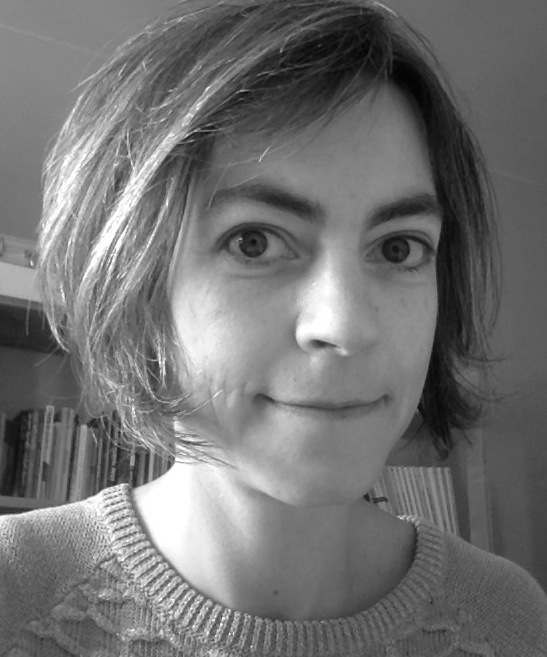 Details of other AiW posts in the series follow this one – Aurélie Journo’s – below. What role does the press – past and present – play in disseminating African literature and in shaping the way it is produced and read? As part of the AHRC-funded ongoing project ‘Popular print and reading cultures in francophone Africa ’, and following a conference entitled ‘Paper, Airwaves, Screen’ held in Bristol in July 2017, the University Paul-Valéry Montpellier 3 hosted a conference on ‘African Literature and the Press’ on March 19th and 20th 2018. Scholars and literary practitioners (journalists, cultural commentators and writers) gathered to discuss the various points of contact and reciprocal influence between the press and African literature. 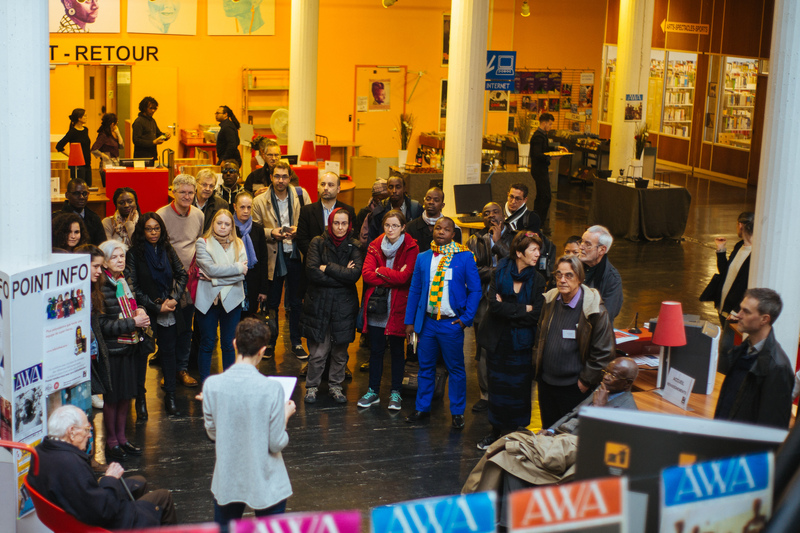 Visitors attend the opening of the AWA exhibit in Montpellier. Courtesy Laurie Guizard. The conference dealt with a variety of issues and sources ranging from the colonial period to the 21st century, encompassing examples from sub-Saharan Africa to Madagascar and Algeria. Sessions covered missionary and colonial press, East African small magazines, the role of the press in African writers’ trajectory and the reception of their work, but also on individual writers, such as Boubacar Boris Diop. In the closing keynote session moderated by Claire Ducournau, Olympe Bhêly-Quenum, editor of La Vie africaine (1959-1965) and L’Afrique actuelle (1965-1969) discussed his 70-year career as a writer, journalist, editor and literary critic, emphasizing his lifelong commitment to intellectual independence and free thought. 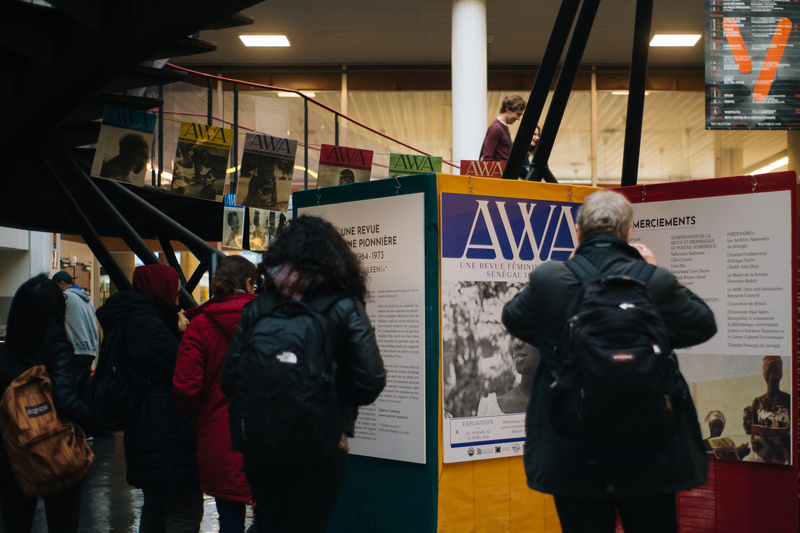 The francophone women’s magazine, Awa, la revue de la femme noire, was also one of the focus points of the conference, with the launch of the Awa exhibition at the University library on March 19th, and a session devoted to Awa on the 20th. Founded in Dakar in 1964, in the context of political independences, Awa, La revue de la femme noire, was one of the first independent women’s magazines on the continent. It was created by a Senegalese intellectual and journalist, Annette Mbaye d’Erneville, who was trained at the Ecole Normale of Rufisque and later studied journalism in Paris. She was close to the African intellectual circles present in Paris in the 1940s and 1950s and an occasional contributor to Présence Africaine and Bingo. Through portraits and interviews of professional women (artists, pilots, MPs, journalists), the magazine was a textual space where women’s visibility in public space could be foregrounded, examined and questioned. Complicating the frivolity often associated with illustrated women’s magazines, Awa featured light pieces on cooking and fashion alongside more serious texts, such as fiction and poetry, essays, and investigative pieces reflecting more profound issues the editors sought to address (gender inequalities, education, political commitment). Though the editors eschewed the ‘feminist’ label the wide-ranging content fostered a form of solidarity among women. The magazine’s voices, free and daring in tone, were varied and brought into dialogue men and women (according to Fatoumata Sow, 58% of the contributors were women, while 42% were men). With 17 issues published between 1964 and 1973, the magazine circulated beyond Senegal and West Africa, to Europe, Russia and the United Stated as evidenced by the letters sent by readers. AWA covers on display at the exhibition in Montpellier. Courtesy Laurie Guizard. Marie-Ève Thérenty, a specialist of the French press, demonstrated in her paper, the magazine’s positioning was one of constant negotiation. With its variety of cover pictures ( most by Baïdy Sow), illustrations, fashion photographs (sometimes sent by readers) and comic strips (Awa déchaînée), the magazine represented a visual space in which a multifaceted, almost ‘anamorphic’ (Marie-Ève Thérenty) image of women could emerge. This image constantly negotiated the tensions between tradition and modernity, between submission to and emancipation from gender roles, an image that was constructed in the interaction between the editors and the magazine’s (male and female) readers. The very title of the magazine, Awa, by referring to Eve or Hawwâ’ in Arabic, personifies the magazine as a fictional character, a universal feminine figure that may be invested with a variety of signifiers, from the seductive temptress reminiscent of Drum magazine cover girls, to the fallen woman bearing the weight of the original curse, to the more positive image of the original mother of mankind. If the title echoes similarly personified women’s magazines (Grazia, Elle, Marie Claire, Amina), the sub-heading, la revue de la femme noire, reflects the pull towards the model of the intellectual, non-commercial small magazine. The panels at the conference in Montpellier are just the most recent examples of renewed interest in popular francophone magazines created in the 1950s and 1960s, such as La Vie africaine, Bingo and Awa. Another notable example is the ‘Popular print and reading cultures in francophone Africa’ project led by Dr Ruth Bush (University of Bristol, UK) and Dr Claire Ducournau (University Paul-Valéry Montpellier 3, RIRRA21, France). The project brought together European universities, the IFAN-CAD (Institut Fondamental d’Afrique Noire – Cheikh Anta Diop), the National Archives of Senegal and the Musée de la Femme – Henriette-Bathily in Dakar. Thanks to this project, the entire content of Awa was digitized by the IFAN (University Cheikh Anta Diop, Dakar) in 2017 and is now freely accessible at www.awamagazine.org. An exhibition was also launched, first at the Musée de la femme in Dakar November 2017 through January 2018, before travelling to the University Paul-Valéry Montpelier 3 Ramon Llull Library, where it remained until April 20th. Visitors take in the AWA exhibit in Montpellier. Courtesy Laurie Guizard. The exhibit’s beautifully illustrated and clearly written information panels retrace the history of the magazine and its founders, grounding it in the historical, socio-political, cultural and economic context of its emergence. Glass display cases showcase original pages from the magazine, allowing the visitor a first-hand experience of the magazine’s aesthetics and tone. A video-installation shows two 2008 documentaries on Awa founder and radio journalist Annette Mbaye d’Erneville : Mère-Bi, directed by her son Ousmane William Mbaye, and Jigeen bu jambar ! Annette Mbaye d’Erneville : championne des femmes et militante culturelle by Debra S. Boyd. The visitor can also watch Diabou Bessane’s 2012 documentary Les mamans de l’indépendance, which focuses on the largely forgotten active political role women played in Senegal’s independence movement. 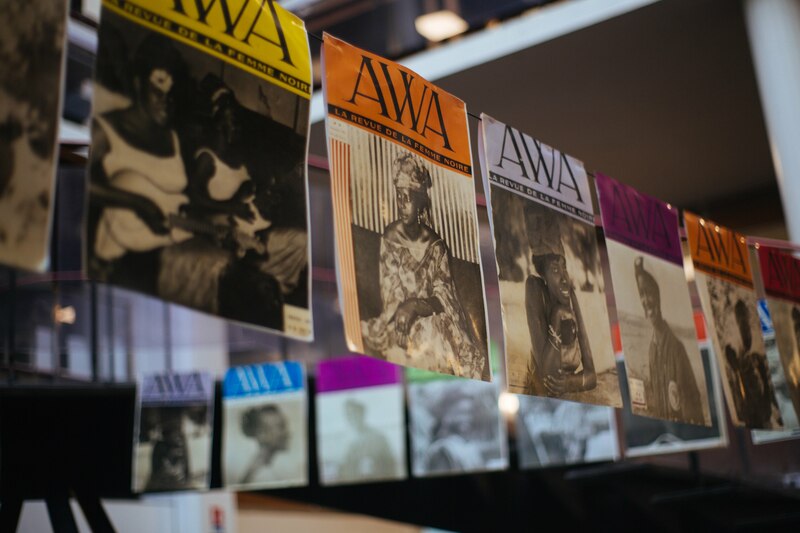 Colour posters of Awa covers further allow the visitor to get a feel of the magazine. In the museum space of the Musée de la femme Henriette-Bathily, a photo booth enabled visitors to pose as Awa cover models. In the long run, the exhibition is expected to continue travelling, in Africa and beyond, with exhibitions planned in France, Senegal, Belgium, and the United States. One of the most interesting aspects of the project lies in its methodology of border-crossing and in the perspectives – and questions – it opens in terms of the production of knowledge and the archiving of the ephemeral objects periodicals represent. In this sense, it is in dialogue with another AHRC-funded project called ‘Small Magazines, Literary Networks and Self-Fashioning in Africa and its Diasporas’ led by Madhu Krishnan (University of Bristol) and Christopher Ouma (University of Cape Town). (You can catch up on previous coverage of this project on AiW here). The circulation of the exhibition beyond Senegal testifies to geographical border crossing, a characteristic of such periodicals’ circulation beyond the region where they were produced. The collaboration between scholars, journalists and curators from Africa and Europe hints at the productive effects of opening academic research to dialogue with other fields of knowledge production, a methodology that similarly underlies the ‘Small Magazines’ project. In her paper, presented at the University of Bristol in January 2018 during the ‘Small Magazines’ symposium, Ruth Bush asserted that the digitisation of the magazine and the exhibition itself should be considered as research. The collaborative process around the exhibition (with the active part played by the Advisory Board composed of Annette Mbaye d’Erneville and her daughter, Senegalese journalist Codou Bop and French and Senegalese sociologists, historians and curators such as Fatou Sow, Pascale Barthélémy and Sarah Frioux-Salgas) implied revising one’s interpretation of the magazine’s political stance, for example. It also meant working towards making the archive and its history alive and accessible to the general public in Africa and beyond, an endeavour that will hopefully be emulated with other similarly “forgotten” magazines. Aurélie Journo was trained at the École Normale Supérieure, Lyon, France. She is currently a Lecturer in Anglophone Literatures at the University Paris-13-Sorbonne Paris Cité. Her main interest is in the field of contemporary Anglophone literature from East Africa. She is interested in the sociology of literature and in the analysis of literary sociability and networks and is currently working on past and present African literary journals and literary practices. She has published articles on the literary journal Kwani? and Kenyan contemporary literature in Postcolonial Text, The Literary Encyclopedia and elsewhere. She is currently working on her first book. This is part of a series of articles publishing on Africa in Words that come out of conversations between a new interdisciplinary network of researchers and literary producers examining the circulation and production of small magazines in Sub-Sahran Africa. This AHRC Research Network, ‘Small Magazines, Literary Networks and Self-Fashioning in Africa and its Diasporas’ is convened by Dr Madhu Krishnan (University of Bristol) and Dr Chris Ouma (University of Cape Town). You can follow the ongoing project, upcoming events, and future publications at https://www.smallmagazinesafrica.org. And Finding Affiliations: Reading Communities, Literary Institutions & Small Magazines, by our guest author Sarah Smit.